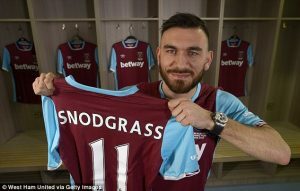 Over two-thirds of supporters who voted in Claret and Hugh’s Bank Holiday poll believe West Ham should cut their losses on Robert Snodgrass and sell him if an offer comes in this Summer. Almost two thousand fans voted in the poll with 1,341 (67.97%) saying we should sell him and recover as much money as possible. 510 fans (25.85%) want to stick by him and give him another chance while 122 people (6.18%) are undecided on the matter. The 29-year-old moved to the London Stadium in January for £10.2 million after impressing for Hull City in the first part of the season. However, he has failed to replicate his Hull City form and has quickly found himself on the bench. He joined Hull from Norwich in 2014 for a fee in excess of £6m. Snodgrass has yet to score despite making two assists for Slaven Bilic’s side and he has spent the majority of his fifteen games for the club on the substitutes’ bench. He is reportedly wanted by newly promoted Brighton & Hove Albion who are said to be considering a £8million bid for the West Ham winger. ← Poll: Goalkeepers stick or twist?